There are so many stunning customised V-twins in Daytona Beach during Bike Week that a standard production bike has to be pretty special to stand out from the crowd. And the Victory Hammer certainly turned plenty of heads as it thundered down the Daytona streets. As I dropped the Hammer's clutch at the lights and charged away at the head of the pack, with the big V-twin motor churning out low-rev torque through the gigantic back tyre, and the Florida sunshine glinting off chrome and custom-style paintwork, the big Victory felt mighty good. With its 1634cc V-twin engine putting down power through a six-speed transmission and a gigantic 250-section rear radial, the Hammer includes features that Harley-Davidson doesn't yet fit as standard. Add to those attractions the Hammer's neat, flowing styling, and it's easy to see why Victory is now making quite an impact in the States, after a difficult start. The Hammer is rolling proof that Victory has its finger on the pulse of American motorcycling, in a way that the firm certainly didn't a decade ago when it was created as the two-wheeled division of snowmobile giant Polaris. 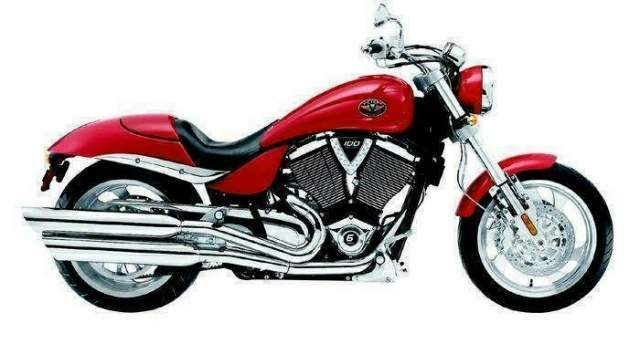 Victory's first bike, the V92C, was a capable cruiser that handled well but looked too dull to be a hit in the style-obsessed cruiser world. Three years ago Victory made a big leap forward with the Vegas, a much classier looking machine designed with the help of custom legend Arlen Ness and his son Cory. The Ness touch transformed the ugly duckling V92, giving Victory a sales boost that contrasted with the declining fortunes of one-time rival American marques Indian and Excelsior-Henderson, both of which have now ceased production. 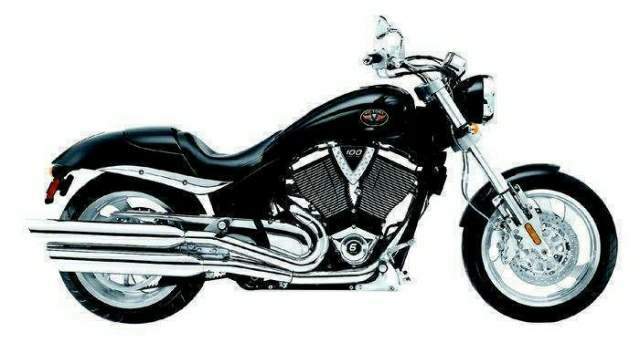 When Victory was looking for a way to develop the Vega, the temptation must have been to join the cruiser manufacturers' capacity race, against the likes of Kawasaki's VN2000 and Triumph's Rocket III triple. Instead the Minnesota firm took its inspiration from the modifications that many Harley owners were making to their bikes. 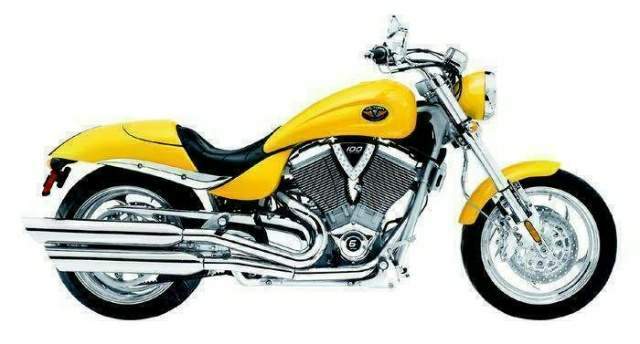 Top of the aftermarket wish-lists - and especially popular with the chopper crowd - were six-speed gearboxes and ultra-fat rear tyres, so Victory added both features to the Hammer. Victory couldn't resist enlarging the V92 engine while they were at it. Boring out the sohc, four-valves-per-cylinder engine by 4mm gave dimensions of 101 x 102mm and increased capacity from 1507cc to 1634cc, or from 92 to 100 cubic inches in American. While they were at it, they increased compression ratio from 9.2 to 9.7:1, and fitted new camshafts for extra low-rev torque. Along with the extra cog in the gearbox, the Hammer motor got slimmer crankcases, quieter-running camchains, and a smaller sump that allowed the chassis to be made narrower. The fuel injection system was also revised. Victory don't issue power figures but rear-wheel output is slightly up on the Vegas's figure at just under 80bhp. Victory did very little to alter the Vegas's distinctive shape or its twin-downtube, steel-framed chassis layout. But the Hammer gets upside-down front forks and twin 300mm discs with four-pot Brembo calipers, instead of the Vegas's conventional forks and single disc. And then there's that gigantic rear Dunlop Elite 3 radial, so fat it looks as though it'd be more at home on a car than a bike. Instead the Hammer felt mighty good as I rumbled round Daytona, its eye-catching looks fully justifying the Victory ad-line that it "hits you like a chromed-out knuckle sandwich". Neat details include the V-shaped handlebars and twin white-faced dials in the instrument panel, the chromed-and-dimpled covers between the Vee of the cylinders on either side, and the classy rear light, which is built into the tailpiece. The Hammer lived up to its name by hitting hard in a straight line, too, both when leaving the lights and when being opened up at higher speeds. The motor gets into its stride at about 2500rpm, and from that point on it's mighty strong, with crisp throttle response and a pleasant, non-intrusive V-twin vibration from the 50-degree, balancer-shaft equipped motor. The new six-speed gearbox generally worked well, though in town it occasionally needed a quick left-boot shuffle to find neutral, perhaps because the reasonably firm-action clutch was dragging very slightly. That overdrive sixth ratio certainly helped keep revs down at cruising speeds, too, meaning the Hammer was chugging lazily along at just 2800rpm at an indicated 80mph. Yet the Victory still had enough low-rev stomp in hand to thunder away from that speed, heading for a top speed of about 130mph. Keeping up a cruising speed of much more than 70mph wouldn't be fun for long due to the high and wide riding position, which puts feet well forward and almost all the rider's weight on the seat. At least the Hammer can quickly be fitted with touring accessories, including a snap-on windshield and a saddle with built-in rider's backrest. Curves are pretty hard to come by near Daytona but eventually I found a few, and the Hammer proved as good as most cruisers. That's despite the huge rear boot, which inevitably slowed steering that was already hardly lightning quick due to the long 1676mm wheelbase and kicked-out rake angle of 32.9 degrees. The ultra-wide rear end took a little getting used to, especially in town. When changing direction the Victory needed a firm push on the handlebars, and then a constant slight pressure to keep the big bike tracking through a turn. In a way that's a bit of a shame because the Hammer's sturdy frame and upside-down forks, increased ground clearance due to the narrower engine and frame, and reasonably firm spring and damping rates would otherwise have made it one of the better-handling big cruisers. As it is, the slimmer-tyred Vegas is more manageable if you don't mind its relatively emaciated view from the rear. The Hammer has the edge on braking, though, thanks to that pair of four-pot Brembo calipers biting on 300mm discs, with help from braided lines plus the rear disc with its abundance of rear-rubber contact patch. Few cruisers stop any harder, despite the Victory's near 300kg of dry weight. Most details are well sorted, too, notably the excellent quality of paint and chrome, and touches including the pillion seat cover and simple yet effective mirrors and switchgear. Victory has been building snowmobiles for half a century, so knows a bit about making weather-resistant machinery that should cope well with this country's un-Florida-like climate. Building a new American cruiser brand in the shadow of Harley-Davidson ain't easy, as the failure of Indian and Excelsior-Henderson has shown. But the Hammer suggests that Victory is on the right track. At £12,995 it costs £1300 more than the Vegas at Victory's half-dozen UK dealerships, but that money buys a bike with a unique blend of performance and custom style.